In May 2012 we reported the launch of the first Benetti Classic Supreme 132 series and now, named Petrus II, she's due to make her US debut at next month's Miami show. 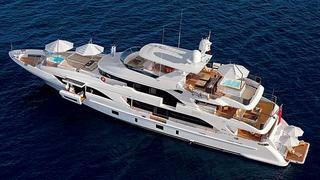 She's a 40.2m composite trideck motor yacht designed by Stefano Righini. Petrus II follows the current philosophy of having extensive outside spaces, largely covered to create shade, and large openings in the hull and superstructure to bring natural light into the interior. The interior furnishings of Petrus II are of natural oak and wengè, enriched with handmade leather inserts. Other special materials are also used: structural wengè to give a three dimensional effect, diamond shaped panels in ivory coloured natural leather in the owner's and the VIP cabins rise from behind the head of the berths and continue up to the ceiling, while in other spaces, like the main saloon, there are recessed ceiling lights. A mix of marble, leather finish and mosaics are used in the heads. The main deck owner's suite has two entrances – one from the corridor/office and the other from beside the bed. The other feature is an sea terrace that allows the owner to have a private verandah over the water. Below deck there are four guest staterooms – two VIPs and two twins – all above average in size and all have ample windows with views of the sea.